(Clearance Sale) Easy clean and durable Anti-Fingerprint stainless steel surface. 0.6 inches ultra-thin, sleek, stylish, modern, contemporary design, large magic lens Blue Backlit LCD Display. Auto Turn Off in 60 seconds if left idle after it is turned ON. Auto Turn Off in 180 seconds if left idle during weighing. Powered by 3 x AAA batteries (included), 100% product and shopping satisfaction guaranteed. 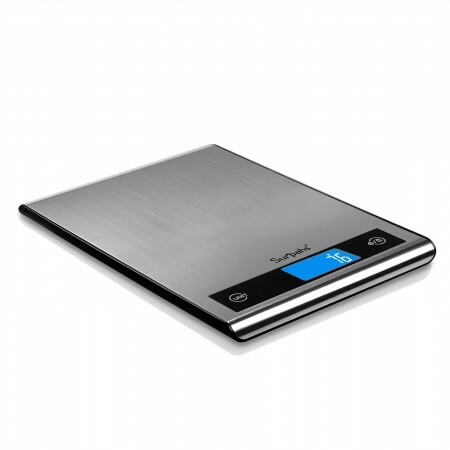 Give your kitchen a contemporary edge with the Surpahs Thinner Anti-Fingerprint Stainless Steel Digital Kitchen Scale. This ultra thin 6 inch scale has a sleek, modern design that not only looks beautiful, but stylish with its large and nice blue backlight LCD display. With an easy to clean and fingerprint-resistant stainless steel surface, you can enjoy the benefits of accuracy and style all in one. It turns off in 60 seconds if no operations after it is turned ON. It turns off in 180 seconds if operations during weighing. SURPAHS Guarantee: 100% Guaranteed Product Satisfaction, 2 year manufacturer warranty. Customer satisfaction is our highest priority. Visit SURPAHS website or Scan QR code on product box to contact for support with our products.